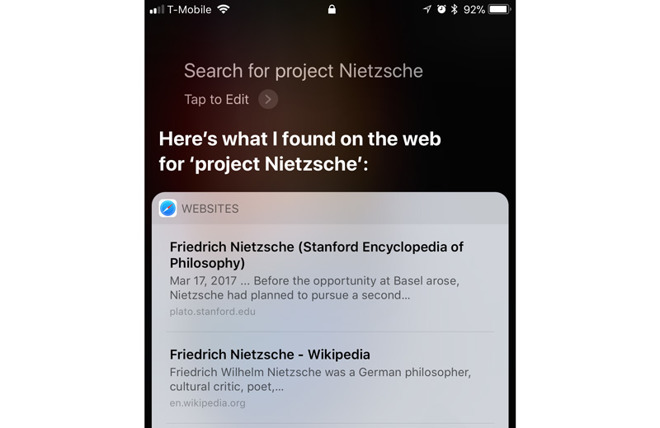 Apple is switching from Microsoft's Bing to Google as the default Web search provider for Siri, iOS Search, and Spotlight on the Mac, the company announced on Monday. "Switching to Google as the web search provider for Siri, Search within iOS and Spotlight on Mac will allow these services to have a consistent web search experience with the default in Safari," the company said in a statement to TechCrunch. The company insisted that it has "strong relationships" with both Microsoft and Google. While video results will point to Google's YouTube, searches for Web images will still pull from Bing. Apple has sometimes been criticized for defaulting to Bing outside of Safari, since Google is significantly more popular, but image search is a particular speciality of Microsoft's search engine. The news comes in tandem with the launch of macOS High Sierra. The free update will make a number of enhancements to apps and underlying frameworks, including support for the Apple File System, H.265 video, and Metal 2 rendering. The company is also clamping down on cookie-based user tracking, to the consternation of many parties in the advertising industry.